Sets of cookware pots and pans matter if you love to cook, want your food to turn out right, and if you do not want a major cleanup. Cookware set reviews will help you to choose the best cookware set that is perfect for you. When choosing a cookware set, it is important to know about the quality of the cookware, how use it, how to care for it; and above all the safety of materials that are used in the cookware. 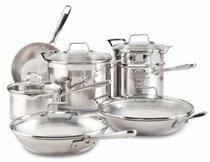 I've often wondered, "What are the best cookware sets available?" What I've learned is there is variance in opinions. Opinions are formed by life experiences and cooking styles. Cookware set reviews will help you to decide based on your style and knowledge of cooking, which set of cookware will best meet your needs. The following reviews are being developed to assist you in choosing a cookware set that is perfect for you. Cookware sets are made of several different materials that accommodate different styles of cooking. The following reflect choices that you will encounter when shopping for cookware. Reviewing your style of cooking and preferences along with reading cookware set reviews will aide you in making an informed decision concerning which type of dinnerware is best for you. In general, cookware sets are not suitable for use in the microwave, oven, broiler, or on campfires, unless the description specifically says that it is. Most is just for stove top use. Some cookware is oven proof to a certain degree that is usually stated in the owner's guide or in the product description. Induction cooking is becoming more popular since the price of induction ranges went down. Some cookware won't work with this type of stove without a special interface disk. If you plan on using an induction range, it is a good idea to check to make sure that the cookware states that it works with an induction cook top. Once upon a time, a friend of mine was raving about a particular non stick cookware set (she was in her 50s and I was in my 20s). I was struggling to decide which cookware set to buy. I took her advice and bought the pans she was so excited about. They turned out to be a disaster for me. I was fairly new to cooking and I simply didn't know that using metal utensils in non-stick cookware would destroy it. I also cooked everything with the burners on high. My husband always teased me by saying, "I know when dinner's ready because the smoke alarms go off." My family mostly used a stainless cookware set and cast iron cookware sets when I was learning how to cook. I fried food a lot and often burned the pans, in addition to scratching the coating. I had the bad habit of letting the pans soak, instead of cleaning them right away. Purchasing that set was a huge waste of money for me because of the way that I cooked and my lack of knowledge for caring for the pans. In later years, after I had actually learned how to cook, started eating more healthy and developed better housekeeping skills, I tried a single pan with non-stick coating. I absolutely loved it. That was until my kids started learning how to cook. At that point the pan became a disaster waiting to happen.